Kryptonite New York Noose 1275: Best portable chain? I will guide you through the 3 simple steps to find the best bike lock in 2018. I've got the ultimate guide on how to lock your bike. And much, much more! Who’s trying to steal your bike? Do BEFORE your bike’s stolen! Do AFTER your bike’s stolen! Bike insurance: do we need it? Kryptonite New York Noose 1275: The best chain lock? The Kryptonite New York Noose 1275 is a highly secure, portable chain lock. Really, it’s at the very limit of what can be considered portable, (a lock that is practical to carry round every day). But it uses a clever technique to achieve a high security to weight ratio while still being useful. In this this review I’ll look at just how secure it is, how easy it is to carry around and whether it’s straightforward to use. And at the end of the review, I suggest some alternatives to consider if this isn’t the right lock for you. With 12 mm thick, hardened manganese steel links, the New York Noose is a very tough chain. While theoretically it can be defeated by the very biggest, 42″ bolt cutters, it would take a skillful, heavy thief, using the ground for leverage. And in reality, with the right locking technique you can make this almost impossible. The Evolution Series 4 Disc Lock boasts a 14 mm MAX-Performance steel shackle which is significantly stronger than the steel used in Kryptonite’s older and cheaper locks. It’s also drill resistant, pull resistant and double bolted which means it would need to be cut twice to force it open. This formidable level of protection is reflected in the lock’s security ratings. Kryptonite themselves give it 9/10 (High Security). Sold Secure rate it as Gold. And ART give it 4/5 stars. Have no doubt, there are very few other bike locks that can match this level of security! Is it easy to carry to carry around? Transporting a chain lock is relatively simple: just wrap it around your seat post or top bar or fasten it to your luggage rack. And of course, the New York Noose is covered in a hardy nylon sheath which should protect your paintwork. Easy! The problem with chain locks though, is their weight. They are significantly heavier than U-locks. And thick chains can be very, very heavy. The New York Noose 1275 weighs 6.95 lb (3.15 kg), which is about the same as 8 cans of Coke. And while it’s far from the heaviest chain lock, it weighs more than the heaviest, most secure U-lock available today (the Kryptonite New York Lock M18-WL)! And although the best place to transport a heavy item is probably around your seat post where it shouldn’t interfere with your center of gravity, you will definitely still notice this weight if you’re carry it around every day. In fact, I would say that the New York Noose 1275 is at the very limit of what can be practically carried around daily. If it was any heavier, you would need to use it as a stationary lock. Indeed, it’s probably the only chain with 12 mm links that can be realistically be classified as a portable lock. The thing that distinguishes this lock from other chain locks is the “noose”. What’s the noose? Well, at one end of the chain is larger, circular link. And the other end of the chain can be passed through this circular link to create a noose. The photo below illustrates this with the longer version of this lock, the New York Noose 1213. Why is this so great? Well it means you can lock more stuff with less chain! With a normal locking method, both ends of the chain need to meet after passing around whatever you’re locking. So there’s always two lengths of chain between the immovable object and the bike. In fact, Kryptonite claim that this 2.5 ft noose chain will give you the same “in-use” length as a normal 3.5 ft chain. Which is fantastic! As I’ve said before, chain locks are really heavy, so anything that allows you to lock more stuff with less chain is very, very welcome. Of course there’s nothing to stop you using the New York Noose just like a normal chain lock. This system just gives you lots more options, which is exactly what you want from a bike lock! The lock comes with 3 keys, one of which has a light to help you out in the dark. And it’s also eligible for Kryptonite’s fantastic Key Safe Program, which allows you to register your keys online, so that you can easily get replacements should you ever loose them. The first set will even come free! Read more about Kryptonite’s unmatched after sales service here. The disc lock that comes with the New York Noose has a sliding dust cover to protect the mechanism from the worst of the street grime. However, be aware that these covers can also trap moisture inside the lock, which if it freezes, may well jam the mechanism. But you can reduce the chance of this happening with regular maintenance. All bike locks need a little looking after now and again, especially if they are outside for long periods of time in cold and wet conditions. A good clean, and some lubrication of both the mechanism and the shackle will keep a good quality lock working smoothly for years. And this is a very good quality lock! Find out the best way to look after your lock here. The New York Noose is eligible for Kryptonite’s own Anti-Theft Protection which can pay out up to $3,500, £1,300 or €1,000 if your bike stolen as a result of this lock being defeated. I talk about Anti-Theft Protection in much more detail in the Abus vs Kryptonite vs OnGuard page. But it’s worth mentioning here that the cover is not free, you need to register as soon as you buy the lock and despite Kryptonite offering the best of these schemes, it’s still difficult to qualify for payment. It’s much better to cover your bike under your normal household insurance or take out specialized bike insurance. I think the New York Noose 1275 is the most secure, portable chain lock available today. This is largely because, it’s the only 12 mm chain that’s short and light enough to be carried around daily. A bigger lock would be too heavy and unwieldy to use every day in the street. Whereas this lock is short enough and just about light enough to work well. But make sure you check the weight and length. It’s still a very heavy, short chain. The noose system makes the most of the available length but there will be occasions when you wished you had a little more. And if you want the same level of protection from a lighter lock, you might be better off with a U-lock. Having said that, chain locks can be simpler to transport than U-locks and they often give you more locking options. Indeed, one of the great things about this lock is it’s versatility. You can use it as a secondary, stationary lock to secure your bike at home and then take it out if you need a little bit of extra security in the street. Or of course, you can use it every day as your main, portable lock. However you use it, you can be very sure it will to provide fantastic protection for you bike. The security ratings speak for themselves. And it looks incredibly intimidating. The vast majority of thieves won’t even consider trying to steal a bike secured with this lock. So, do check the weight and the length carefully. But if your looking for a chain lock that offers the very highest level of protection while still remaining both portable and practical this could well be the best bike lock for you! Whether you’re looking for something longer, lighter or cheaper, there are alternatives to the New York Noose. For me, none of them offer the same great balance of price, security and practicality as the New York Noose 1275, but please check them out anyway! Although the 1275 makes the very most of it’s 30″ (75 cm), some will still find it too short. For these people, Kryptonite provide the New York Noose 1213. This is the big brother of the 1275 and measuring 51.0” (130 cm) it’s almost twice as long. With noose locks, the longer the chain, the greater the advantage over normal chains. And the 1213 gives you the same usable length as 65″ (165 cm) of normal chain! This is a massive difference and means you’re getting one of the most practical chain locks available today. Unfortunately this also makes it much heavier. Weighing 10.55 lb (4.79 kg), that’s the same as 12.5 cans of Coke! So this is definitely not a portable lock. But if you’re looking for a high security chain lock with the best usable length to weight ratio (and the 1275 is just too short), the New York Noose 1213 may be what you need. A lighter chain will obviously be less secure. But if the New York Noose is too heavy, you could try the Abus City Chain-X-Plus 1060. Abus usually produce the locks with the best security to weight ratio. So even though the links are 10 mm, it’s still a very formidable lock. Indeed, Abus give it a maximum 15/15 security rating, Sold Secure rate it as Gold, and ART give it 2/5 stars. It’s got an integrated lock which makes it much easier to use. And comes in four lengths: 85 cm, 110 cm, 140 cm and 170 cm. The 33.0” (85 cm) is closest to the New York Noose 1275, and weighing 4.63 lb (2.1 kg), its a good 30% lighter. Bear in mind, it’s not a noose lock, so it’s not quite as practical as the 1275. But if you’re looking for high security, portable chain that weighs less than 7 cans of Coke this is a really good choice! When you’re looking for great value for money, OnGuard in always a good bet. The OnGuard 8017 Beast is a 12 mm thick, high security chain with a separate lock. It’s significantly longer than the New York Noose, measuring 43″ (110 cm). And it’s also much heavier, coming in at a whopping 9.2 lb (4.17 kg), which is the same as 11 cans of Coke! This is definitely not a portable chain. But it’s very secure. Neither Sold Secure or ART have rated the Beast but OnGuard give it a very impressive 95/100. The prices vary but I have seen this lock cheaper than the New York Noose 1275. And of course you’re getting much more chain for your money as well! So, if price is your main concern check out the OnGuard 8017 Beast, as it provides very high security and a very reasonable price! If none of the chains feel right to you, don’t forget my simple, 3 step guide to choosing the best bike lock! Thanks a lot for the drawing of how to use the noose lock – I had wondered! I don’t see how the noose is of any use. In the diagram the padlock has to be secured through the chain… and you can’t because it’s all sheathed. Can’t you just push the sheath back to have access to a chain link? I don’t have this chain lock, but it seems that you can lock the padlock around the chain. So you create a second sliding noose and the sheath is no problem. Dave – the diagram is not very accurate. The lock is big enough to go go around the chain, or around the frame or wheel of the bike, not through an individual link of the chain. The noose system is far superior to non-noose because you can get both wheels with much less chain and thus weight. I will be posting pictures on my website soon. It’s a great lock but you’re still not fully exploiting its cleverness. In your usage diagram, you don’t need to wrap the chain around the bike tube, and pass the min-Ulock through two links. All you need to do is pass it through the very last link, then close the u-lock around the bike tube, like you would with any u-lock. If it helps you visualize: in the “B” in your diagram there isn’t a chain loop at all on the right side, the chain only come up to the tube and not around it, and the U-lock passes through the last chain link and then closes around the bike frame tube. You will get a longer effective length this way, eliminating one of the “nooses” (also it resolves the problem that you didn’t note with your approach, that the sheath would get in the way). Of course you also should be running the chain through a tire too, like any chain. Yes you’re right. Of course that’s dependent on the u-lock having enough internal space to close around the tube (which may not be the case with some mountain bikes etc). But yes, I will update the article and add another diagram. I think any “traditional” bike with a “round” tube would have no problem with that. The tube might have to be approaching 2″ diameter before it starts to become a concern. But, point taken. Why do the shorter chain versions of these Krypto locks seem to be cheaper than the longer chain versions? 1275 has shorter chain and is $20 more than the 1213 with longer chain. The same is true of the New York chain locks on Amazon. 1410 with the 5 foot chain is $35 cheaper than the one with the 39 inch chain. I meant, why do the longer chain versions of this locks seem to be cheaper than the shorter chain versions…. Could be because the shorter chains are more popular? Yeah, that was true six months ago when I bought too. 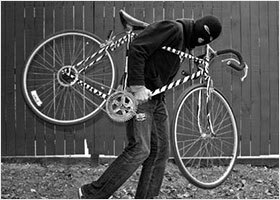 7 things to do BEFORE your bike’s stolen! 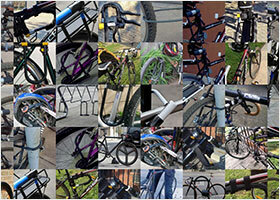 9 things to do AFTER your bike’s stolen! Who’s trying to steal your bike (and what tools are they using)? U-lock vs Chain lock: Which is best? The Foldylock Clipster: even easier to carry! LITELOK: Is this a game changer for bicycle security? Liberate yourself with a beater bike! 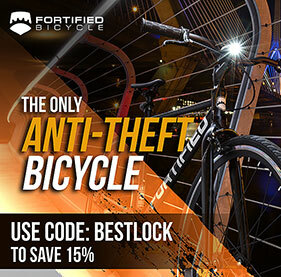 Find the best bike lock for you and your bicycle and learn how to use it properly. Never miss an update or a bargain!